Can anyone identify what the little white (and unclickable) dots are on the map (using the free app on an iPhone)? I see a bunch of them in the neighborhood, but none of them are clickable, and some of them appear on (or in) houses. What are they? I know they aren't Premium Caches, which have larger faded circles in the free app. Hoping these links work for the the images. Can anyone identify what the little white (and unclickable) dots are on the map (using the free app on an iPhone)? I see a bunch of them in the neighborhood, but none of them are clickable, and some of them appear on (or in) houses. What are they? Without knowing where the neighborhood is, it was quite a challenge to figure out what you're asking. Eventually I found some of the dots locally and they show up in either the Intro or the paid iPhone Apps. I don't see them on the Geocaching.com website maps. I was unable to find another map that identifies the locations. Also, the Android version of the App has POIs, but no white dots, and I was not able to get it to show any POI at locations of the iPhone's white dots. In the case where these dots show, tapping (selecting) a dot has no effect. The dot is about 40 feet SE of that cache icon. The white dots appear at high zoom levels, along with labeled POIs such as businesses. I'm guessing the white dots are unlabeled POIs. Maybe in the neighborhood, designating housing developments? Below is the screenshot for reference. 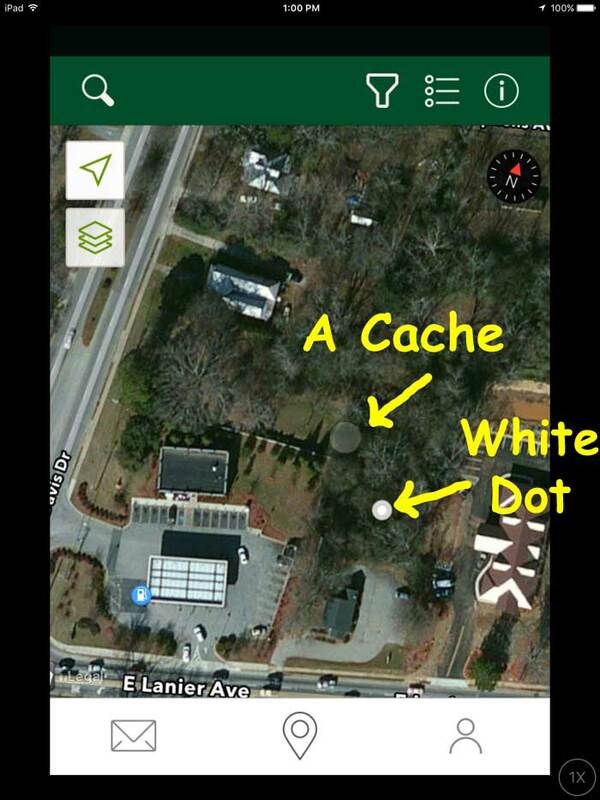 The white dot has nothing to do with the nearby cache, I just posted the cache info for ease of locating one of the white dots in question. The cache is a faint gray dot due to it being what the Intro App calls an "Advanced" cache and offers a "Premium" upgrade to show the cache (determined by Groundspeak to be above the difficulty threshold for a free Intro App Basic member). The white dot here is in the trees behind a catering service, but roughly on the property. Compare that to the blue "gas pump" POI icon of the gas station in the lower left corner of the map. Thanks for the response. Sorry, I guess I could've supplied the neighborhood. It's Oakwood Village in Flanders, NJ. There are quite a few of them in the neighborhood, but no caches nearby. I guess they could be designating businesses being run out of people's apartments, but why would those show up on the map? There's another one just across Rt 206 that is possibly near a cement structure, but there's no actual house there. Thanks for the response. Sorry, I guess I could've supplied the neighborhood. It's Oakwood Village in Flanders, NJ. There are quite a few of them in the neighborhood, but no caches nearby. I guess they could be designating businesses being run out of people's apartments, but why would those show up on the map? POIs commonly identify apartment complexes, or subdivisions. Why it would be just a dot, I don't know. And some of these don't seem to be particularly well aligned with the business, if that's what they're for. Maybe it's a POI in work, waiting for the info to be typed. I can't even tell what database these things are from. But it seems to be an iPhone thing. Try this. Tap the "Layers" icon, and select "Street". The white dots will now show the text of the POI! The one in my example is a tree, but is identified as "Fayette Pregnancy Resource Center" . OK, maybe there is a building there. I'll go check sometime. POIs are not always current, accurate, nor complete.